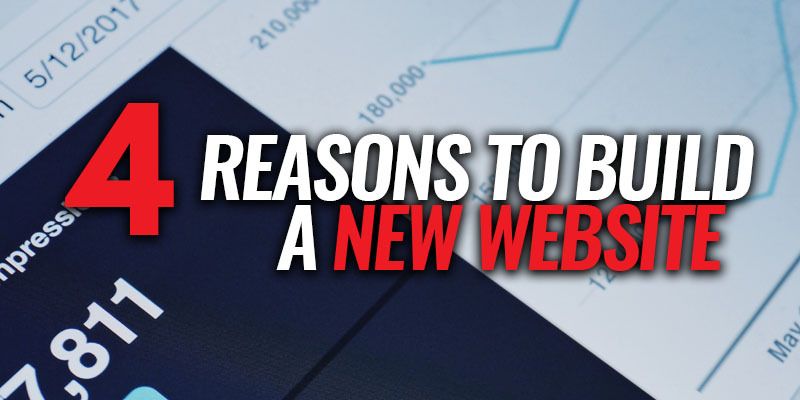 4 Reasons to Build a New Website for Your Business | Sharp Innovations Blog | Sharp Innovations, Inc.
Nowadays, how many businesses don’t have some form of website? Even small businesses know the importance of having an online presence so people can find them. However, many of those websites are years behind the curve in how they were built and even in the information that they contain. While having any online presence is certainly better than having none, having a modern website that follows current industry standards will do significantly more for you and your business than will a website that’s a couple of years old. People now live on their mobile devices. We’ve previously listed extensive reasons why it’s important to think mobile-first, and building a new website is the best way to make that a focus. A majority of Internet traffic occurs on mobile devices, so it is vital to ensure that your website provides a seamless experience across all devices. With so many variants available in the phone and tablet market, the only way to accommodate everyone is through responsive design. While it is possible to make an older website responsive, such a rebuilt site just doesn’t equate to a ground-up, modern redesign with a mobile-first attitude in mind. Another significant benefit to creating a new website now involves SEO considerations that had less or no bearing on your search engine ranking in the past. Even if you aren’t currently investing in SEO work, there are things that can be done during the process of coding a new website that will help your rankings. Making sure code is minified, image optimization in terms of both size and tagging, page canonicalization, and so on are all important to ensuring that your website is set up optimally for the best possible results. The appearance of your website can directly influence how users view your company, product, or service. If your business provides a high quality service or product, your website design should reflect that to the people visiting it. Design styles, techniques, and methodology change drastically with time, so your top-of-the-line website from several years ago certainly won’t showcase your business as well as a new site could today. Keeping on top of your website’s design will give your business a professional appeal more likely to draw in more visitors. Security is more important than ever before, not only from the obvious practical standpoint of keeping your users’ data out of other people’s hands, but also from the perspective of maintaining a sense of trust between your company and your website visitors. Much like a modern website design, people seeing that your site is secure increases their confidence in you and your business. It shows you’re keeping up with the times and staying on top of all aspects of your users’ experience. This also can help with SEO now that search engines – Google in particular – are looking more closely at website security. As the Internet age continues to grow at an exponential rate, websites will only become more ubiquitous and ever important to sustain and grow your business. Refreshing your website is always a good idea as the technology we use to create websites changes as do the techniques behind creating them. If you would like to know more about how your business could benefit from a new website feel free to contact us today for a free consultation. Posted in Branding, Mobile Web Design, SEO, Web & Mobile Security, Website Design, Websites and tagged modern website, reasons to build a new website, Responsive Web Design, SEO, web security on August 22, 2017 by Greg Lauver . What Can Google Analytics Tell You? What Is This Web Coming To?